This contribution focuses on the scholarly social network ResearchGate (RG). We take the cue from a recent change in the information shown on each researcher’s profile page, which now discloses the number of full-text reads, in addition to the already provided number of overall reads. Building on the findings of two previous studies (Orduna-Malea et al. 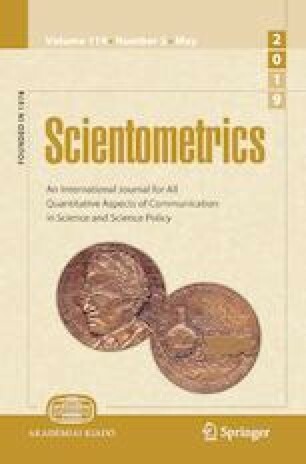 in Scientometrics 112(1):443–460, 2017. https://doi.org/10.1007/s11192-017-2396-9; Copiello and Bonifaci in Scientometrics 114(1):301–306, 2018. https://doi.org/10.1007/s11192-017-2582-9), we delve into the relationship among full-text research items uploaded in that platform, full-text reads of the same items, and the so-called RG Score. The dataset examined here provides conflicting results. Firstly, the number of full-text publications and reads is significantly different, along with the RG Score, for the analyzed samples. Secondly, the RG Score implicitly rewards the ratio between the full-texts available to users and total research items. Moreover, the same score seems to be affected to a greater degree by the level of overall reads. However, apart from an indirect relationship, it does not reward how much attention the full-texts get in comparison to the other research items featured in the scholars’ profile pages. The online version of this article ( https://doi.org/10.1007/s11192-019-03063-6) contains supplementary material, which is available to authorized users. About the storage of full-text articles in RG, we do not thank Elsevier for the profusion of “claimed infringement notices” we got in our mailboxes during the last months, hindering our attempt to raise our RG Score. Kadriu, A. (2013). Discovering value in academic social networks: A case study in ResearchGate. In Proceedings of the ITI 2013 35th international conference on information technology interfaces (pp. 57–62). Zagreb: University Computing Centre - SRCE. https://doi.org/10.2498/iti.2013.0566. Kraker, P., & Lex, E. (2015). A critical look at the ResearchGate Score as a measure of scientific reputation. ASCW’15 workshop at web science 2015, (May), 7–9. https://doi.org/10.5281/zenodo.35401. Liu, X. Z., & Fang, H. (2018). Which academic papers do researchers tend to feature on ResearchGate? Information Research, 23(1). http://www.informationr.net/ir/23-1/paper785.html.